Item shown above : OAK Finish, (Challenge Coins NOT INCLUDED). 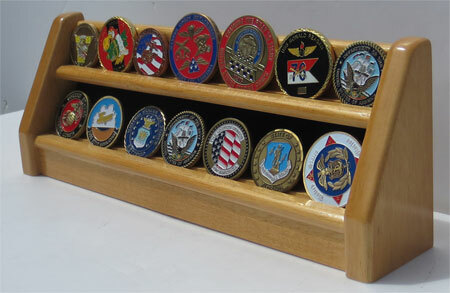 Beautifully crafted 2 Tiers challenge coin display holder/stand. This coin display rack/stand would be a great way to display your antique coins and military/sport challenge coins at your home or office. There are two brackets on the back and ready for hanging.You can display coins up to 1.75" in diameter for the lower row. The top row can hold larger coins. (chips and coins are not included). No assembly required.